Posted on October 16, 2012 by The Flat Girl	in Journal and tagged Affect, daughter, Emotion, Feelings, friends, Interpersonal relationship, Mother, Parent, relationship, support. Rarely do I have what I would be to consider “good” or “exciting” news in my life, rarer still that I would feel compelled to share such news with my mother. However, on Monday, I had just such an experience; I received some thrilling somewhat life-altering information regarding an opportunity I was being offered. Normally, I have kept such news to myself, if I even recognized it, but I certainly would never share with anybody. But, in an effort to grow emotionally, I wanted to take a step out on that proverbial limb. Often times, I have felt twinges of jealousy when I have met women who have wonderful mother-daughter relationships where they share everything, support each other, and are sometimes best friends. I do not mean jealousy in that way where I would wish to deny them their feelings, but where I would like to have more of that in my life. No matter how old I get, I never stop striving for at least a taste of that same bond. Monday was one of my better days in a long time as I shared the joy of my news with other family members, friends, and my significant other. I had a few people who were particularly supportive of me, sharing in my happiness and pride. There are a handful of people who have been particularly encouraging to me; they were especially positive and continually reassuring even as I had a few moments of panic as I worried whether or not I was actually good enough to accept this challenge. As I went throughout my day and weighed this new opportunity, not only for what I would gain immediately by the experience, but also for my future and what it would mean as it pertains to reaching my lifelong goals. Monday was a roller coaster of emotions and I was supported by some wonderful people who offered me accolades each time I questioned my abilities and thought I should take a step back. My biggest supporter has always been my significant other (a term I hate, as I find it very clinical, but he is not yet a husband, not quite a fiancée, and I feel rather old to say “boyfriend”, so… significant other it is), without his support and encouragement, I would never have had the confidence to seek out this prospect to fulfill my dreams to begin with. I have also been lucky enough to have found a small group of friends who have been very caring, inspiring, and helpful. They have become a surrogate family to me at a time when I have sincerely been in need of one. So, on Monday, I was feeling the high of receiving great news and wanting to share it with those that love me and wish me to succeed, those that are proud of me and want to share in my joy. This was one of those times that I wanted to share with my mother and was hoping that we could share one of those mother-daughter bonding moments that I have heard so much about. 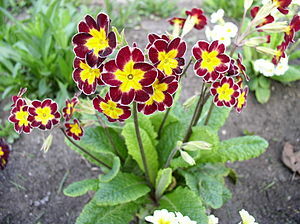 The unknown flowers above are primroses, from the “primula” family. Good for you to be working hard and making progress in your life. Thank you so much… you are right, family can be our worst enemies sometimes… I tried for once and it bit me unfortunately.